Antioxidants can be described as ingredients that extend the shelf life of food products & beverages by providing them protection against corrosion caused by oxidation. Due to their functionality, antioxidants are also known as shelf-life extenders. Antioxidants are used as an additive in food, cosmetics and animal feed manufacturing. Antioxidants also provide an answer to the problem of skin ageing. Cosmetics with antioxidants as active ingredients protect cell membranes and inhibit the oxidation process by neutralising toxic oxygen molecules and free radicals. 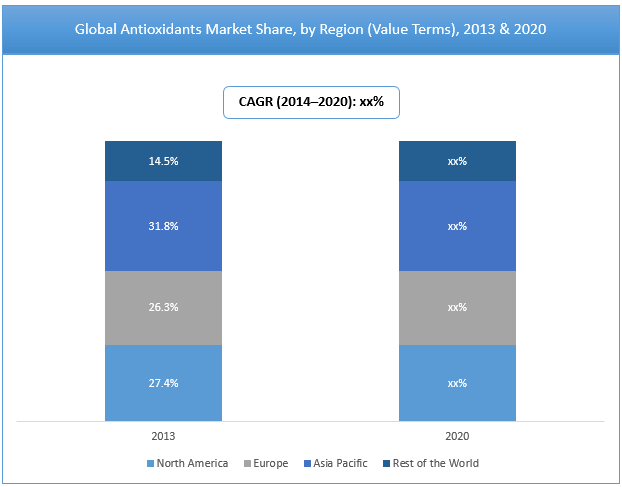 The global antioxidants market was valued at US$ 2,243.8 Mn in 2014 and is expected to reach US$ 3,111.5 Mn by 2020 while expanding at a CAGR of 5.6% between 2014 and 2020. In terms of volume, the antioxidants market was valued at 75.5 thousand tonnes in 2014 and is forecast to reach 103.3 thousand tonnes by 2020 while expanding at a CAGR of 5.3%. The market is primarily driven by increasing global meat consumption, increasing demand for anti-aging products, stringent government regulatory structure and increasing shelf life of food products. The increase in demand for anti-aging products is also stimulating the growth of the global antioxidants market currently. The global economic slowdown had low impact on the global antioxidants market and the market for antioxidants is expected to continue to witness growth during the forecast period. However, changing eating patterns are affecting the market growth regionally, due to changing diet patterns, urbanization and population, and economic growth. The global meat market, worldwide, was valued at US$ 39.2 Trn in 2012 and US$ 40.9 Trn in 2014. Pork meat has been accounting for the largest share in the overall global meat market since the last four years. However, the market for chicken meat has experienced high growth over the last four years. Rising population is boosting the growth of the meat market worldwide. The above table depicts the population trends in the world‘s largest and fastest growing economies, where the demand for feed products is expected to rise rapidly with the rise in population. The global population is expected to reach more than 7.99 Bn by 2025, from 6.9 Bn in 2011. Due to growing life expectancy and robust growth of the agriculture sector, the demand for feed antioxidants in the global meat industry is expected to grow during the forecast period. India and Brazil are amongst the world‘s fast-growing economies and are witnessing a continuous increase in their per capita income. This may cause a standard shift in dietary preferences in both the countries. However, meat consumption patterns are expected to vary across different parts of the world due to cultural, religious and other consumer preference factors. Owing to these factors, the demand for feed antioxidants is expected to grow, in turn, driving the growth of the overall antioxidants market in the coming years. Antioxidants are used in food products to preserve their nutrients, flavour and freshness, thereby preventing food wastage and extending their overall shelf life. In many situations, two or more antioxidants are used in a food product to enhance their food quality protection standards. Preservatives are also used in commercial products to preserve their freshness for a longer time and to keep them free from bacteria. Antioxidants help prevent oxidation of food containing fat or oil and thereby, prevent it from going rancid. Besides, they prevent the browning of vegetables, cut fruit and fruit juices and increase their shelf life. For example, vitamin C, which is also known as ascorbic acid, helps recycle vitamin E. Ascorbates, such as vitamin C, help to remove oxygen through the self-oxidation process. Antioxidants that delay the first steps of the oxidation process are known as primary antioxidants. However, those that slow down the rate of oxidation are known as secondary antioxidants. In addition, other antioxidants, such as tocopherols, inhibit the oxidation process, thereby prolonging shelf life. Some antioxidants are used as flavour enhancers in foods. For example, monosodium glutamate is used in processed foods, such as soups, sausages and sauces. Owing to these advantages, the demand for antioxidants is expected to observe a surge globally, especially from the packaged food industry. Aging is defined as deterioration of physiological functions in organisms. As people get older, their skin loses its defence against external weather due to oxygen deficiency. Increasing pollution is also a major inducer of premature aging as it results in the activation of metalloproteinases that disintegrates collagen. Antioxidants reduce skin aging by dampening free radical formation in the skin. Antioxidants offer protection to cell membranes and prevent the oxidation process by neutralising toxic oxygen molecules and free radicals. There are some proteins present in connective tissues, namely collagen, and elastin, which help keep the skin tight and fresh. As people get older, the production of these protein elements becomes slow; this leads to wrinkles and sagging of skin. Antioxidants help maintain the elasticity of skin by protecting it from free radical attacks. Chain breaking antioxidants, including uric acid, vitamin E, vitamin A, vitamin C and beta-carotene, help to prevent the oxidation chain reaction by terminating free radicals. Antioxidants play an important role in providing anti-aging skin support process by protecting the skin from the toxic effects of free radicals. Besides, vitamin C and glutathione, the most widely used antioxidants, protect the cytoplasm of the cells. Apart from this, antioxidants are also present in cosmetics, such as alpha-tocopherol acetate and tocopherol. These antioxidants help to substantially increase the vitamin E content of the skin. Antioxidants are known for their skin care benefits. For instance, they reduce singlet oxygen and prevent damage to or death of cells. Owing to these factors, the use of antioxidants is expected to increase over the forecast period. The global antioxidants market can be segmented on the basis of natural antioxidants and synthetic antioxidants. The natural antioxidants market is further sub-segmented into rosemary extracts, vitamin A (including carotenoids), vitamin C (including ascorbic acid) and vitamin E (including tocopherols and tocotrienols). The synthetic antioxidants segment includes Butylated Hydroxyanisole (BHA), Butylated Hydroxytoluene (BHT) and others (including Tert-Butylhydroquinone (TBHQ), propyl gallate). The market for synthetic antioxidants segment is comparatively larger as compared to natural antioxidants market and is likely to remain dominant during the forecast period. The global antioxidants market report covers four major regions, namely North America, Europe, Asia-Pacific and Rest of the World. Asia Pacific was the largest market and accounted for 31.90% of the overall market in 2014. The region’s dominance can be attributed to growing demand for health and dietary supplements in Asia Pacific. Moreover, the growth in demand for packaged food products, in turn, is also contributing to the increased demand for antioxidants. Key manufacturers identified in the global antioxidants market include Aland (Jiagsu) Nutraceutical Co. Ltd, Archer-Daniels Midland Company, BASF SE, Cargill Incorporated, DuPont, Kalsec, Inc., Kemin Industries, Inc., Koninklijke DSM N.V., Naturex S.A., Nutreo N.V. and Vitablend Nederland B.V. In order to sustain their market share in the antioxidants market, manufacturers have been entering into various mergers and acquisitions as well as following the strategy of geographic expansion, especially in Asian countries like China, India and other Southeast Asian countries. Future Market Insights (FMI) offers a seven year forecast for the global antioxidants market for the period between 2014 and 2020. The global antioxidants market is expected to grow at a CAGR of 5.6% in terms of revenue during the forecast period. This global antioxidants market study sheds light on the market dynamics and trends in North America, Europe, Asia-Pacific and Rest of the World as well as discusses the important factors expected to influence the current nature and future status of the antioxidants market over the projected period. This Future Market Insights report examines the global antioxidants market for the period 2014–2020. The primary objective of the report is to offer key insights into market trends and opportunities in the antioxidants market across the various regions analyzed. The report also identifies various factors affecting the market’s growth, which include market drivers, restraints and opportunities. These factors determine various market trends, which are influencing the growth of the antioxidants market. Inflation was not taken into account while calculating the pricing during the compilation of this report. The global antioxidants market size has been provided in terms of revenue and volume. Market revenues are defined in US$ Mn. Market volume has been defined in terms of thousand tonnes. Market size and forecast for each product type have been provided in the context of global as well as regional markets. The global antioxidants market has experienced substantial growth over the last few years. Multiple growth factors, such as increasing meat consumption across the globe, surging demand for anti-aging cosmetic products, stringent government regulatory structure and requirement for improving the shelf life of food products, are influencing the antioxidants market’s growth. Antioxidants are considered to be important ingredients in the personal care industry due to their superior ability of reducing singlet oxygen and preventing damage to or death of skin cells. Owing to the aforementioned factors, the demand for antioxidants is expected to increase during the forecast period. In the next section, FMI covers the antioxidants market performance in terms of global antioxidants market revenue and volume split to better understand market dynamics and trends in the antioxidants market. This section also covers a brief overview of antioxidants as well as their value chain analysis. FMI's analysis of key opportunities, drivers and restraints, Porter's five force analysis and the share of the top market players in the Asian region, have also been covered in this section. The key players' section is primarily designed to provide clients with an objective and detailed comparative assessment of key providers specific to a market segment of the antioxidants market value chain. Furthermore, to understand key segments in terms of growth, Future Market Insights has developed the antioxidants market attractiveness index by geography. The resulting index will help providers identify real market opportunities. Impact analysis of key growth drivers and restraints based on the weighted average model has been included in the report to better equip clients with crystal clear decision-making insights. The global antioxidants market has been segmented on the basis of product into natural antioxidants and synthetic antioxidants. The Natural antioxidants segment has been further sub-segmented into Rosemary extracts, vitamin A, vitamin C, vitamin E. Butylated hydroxyanisole, butylated hydroxytoluene. The report provides key insights into these segments for a comprehensive understanding of the antioxidants market. Another section of the report highlights the antioxidants market, by region. It provides the antioxidants market outlook for 2014–2020 and sets the forecast within the context of the antioxidants market ecosystem. This study discusses the overall antioxidants market size as well as the market segmentation by product in various regions. Key regions assessed in this report include North America, Europe, Asia-Pacific and the Rest of the World. Major countries in each of these regions have been analyzed to provide country-level market data. All the above sections evaluate the present scenario and growth prospects for the antioxidants market for the period 2014–2020. We have considered 2013 as the base year for the global antioxidants market report and provided data for the trailing 12 months. To calculate the antioxidants market size, we have considered revenue generated from the sales of various types of antioxidants available in the market. The forecast presented here assesses total revenue across the antioxidants market. In order to offer an accurate forecast, we started by sizing the current antioxidants market, which forms the basis of how the antioxidants market is projected to develop in future. Given the characteristics of the antioxidants market, we triangulated the outcome of three different types of analysis based on the supply side, consumer spending and economic envelope. However, forecasting the antioxidants market in terms of various food preservative segments and regions is more a matter of quantifying expectations and identifying opportunities rather than rationalising them after the forecast has been completed. Thus, a detailed level of information is important for the identification of various key trends in the antioxidants market. In the final section of the report, the antioxidants market competitive landscape has been presented. Key categories of providers covered in this report are antioxidants manufacturers. This section is primarily designed to provide clients with an objective and detailed comparative assessment of key providers specific to a market segment of the antioxidants market value chain. Report audiences can gain segment-specific vendor insights to identify and evaluate key competitors based on an in-depth assessment of their capabilities and success in the antioxidants market. Some of the key competitors covered in the report are Aland (Jiagsu) Nutraceutical Co. Ltd, Archer-Daniels Midland Company, BASF S.E, Cargill Incorporated, DuPont, Kalsec, Inc., Kemin Industries, Inc., Koninklijke DSM N.V., Naturex S.A., Nutreo N.V., and Vitablend Nederland B.V.